With the launch of the iPad, shown above, competitors are trying to show how their touch screen tablet computers are different. (CNET) -- It turns out Apple isn't the only company readying a touch-screen tablet computer. We say that half-jokingly, of course. In the last few months, quite a few companies have signaled their intentions to go head-to-head (or at least offer an alternative) to Apple's much-ballyhooed iPad, which should hit stores in March. 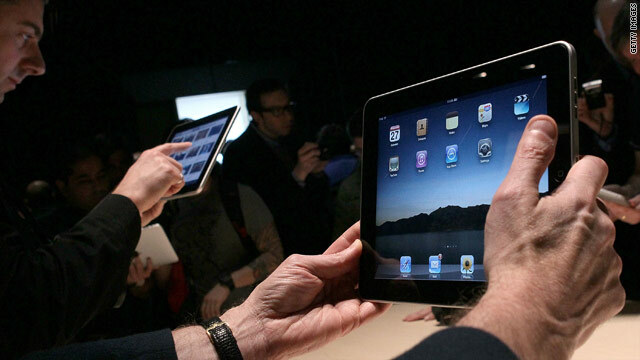 Hewlett-Packard, Dell, Acer, and Sony have or are in the process of readying gadgets they say will compete with the iPad. We've seen some demonstrations at the Consumer Electronics Show and other trade shows, but several gadget makers admitted to waiting to see what Apple was going to do before setting the specifications and price of their competing touch-screen tablets. Now that they know, what are they going to do about it? That might sound a bit silly considering companies like HP, Dell, and Acer have larger market share than Apple -- when it comes to computers. But in other, faster-growing areas -- smartphones and music players -- Apple's popularity far outstrips theirs. And in a new device category (it's reasonable to consider this a new category) they're all essentially starting from scratch. So how will every company not named Apple try to compete for your touch-screen tablet computing dollar, assuming such a dollar exists? They will try to emphasize something about theirs being better, of course, be it in terms of price, style, speeds and feeds, or the movies, books, games, or TV shows available via their gadget. Dell, for example, providing evidence that an old dog can at least attempt new tricks, tends to emphasize style these days. HP's commercials try to sell you on how easily their product fit into your lifestyle. More than anything, they should try to avoid selling it as a computer, in the classic laptop computer sense. If Dell and HP and Acer and their compatriots do that, they'll end up trying to convince people to spend money on basically yet another Netbook; something that's sort of like a PC, but not quite. It's just smaller, cheaper, and with less functionality than a traditional PC. And after sophisticated smartphones and cheaper Netbooks, do consumers really need yet another device that's not quite a laptop? Trying to sell it as a computer that has a touch screen is also unwise because all of these companies have, with some exceptions, been there, done that, and not done that terribly well. Tablets, in the traditional sense, currently account for about 1 percent of the PC market, according to IDC. HP and Dell currently sell tablet computers, but to niches of customers: utility companies, police officers, insurance adjusters, and so on. If the main group every consumer electronics company wants a piece of, mainstream consumers, have mostly resisted their entreaties that tablet computing (in the Microsoft sense) is the future, what would make them change their minds suddenly? You can't say they haven't put a lot of thought into solving this issue. Dell says it's been looking at this category of device for two years; HP researchers have been working on improving touch-based devices in its labs for much longer than that. We can glean what direction it will go with its tablets based on the bits of information already out there. HP and Dell have both shown the basics of their upcoming devices, but with a bare minimum of information on price or details on what's inside. It's fairly clear neither wants to go the same route as Apple. Price-wise, both HP and Dell have said they intend to come in below the iPad, which ranges from $499 to $829 depending on 3G functionality and storage available. That will be easier for Dell since its tablet, the Mini 5, with its 5-inch touch-screen, is almost half the size of the 9.7-inch iPad. When Acer eventually comes up with a competing product, as it has said it plans to, it's also likely to be affordable, perhaps even more so than Dell's or HP's tablets. Emphasizing attractive pricing over fresh new features or design that sets it apart is, for better or worse, what Acer is really good at. The Taiwanese manufacturer seized on the desire for cheaper laptops a few years back and moved swiftly up the ranks of PC makers by dominating in the inexpensive Netbook category. It's now No. 2 overall, right behind leader HP. Sony, which says it is still evaluating its options here, is harder to predict. The company already has several models of e-reader devices, as well as a new touch-screen media device called the Dash. Though not easily portable, at $199 it's not ridiculously expensive either, and it's conceivable that Sony could rework the idea into a more mobile type of package. The operating system is where the iPad's competitors will diverge most. Dell has already claimed its Mini 5 will run Google's Android, and HP's Slate will be a Windows 7 device. The Android experience is closest to the iPad's in that it uses an application store to add new software to the device and is primarily focused on making it easy to consume media in a mobile environment. It would be wise for Dell to emphasize Android for those who want an alternative to the the Apple experience; it's clearly working for mobile phone makers. By presenting the device with Microsoft at CES and by including Windows 7, HP has signaled that it's planning on selling the Slate as a computer, albeit without a physical keyboard. For sure, there will be people who will buy Tablet PC 2.0, but it will be difficult to entice a significant amount of consumers. Businesses could be talked into spending their money on the device. But regular consumers? Don't count on it. Apple has already hinted at which audience it's looking to attract: people who don't want to buy yet another computer. The iPad isn't supposed to replace a laptop. And it's not supposed to replace a smartphone. In the middle somewhere is a device whose purpose is rather murky. It seems clear they're going after the people who don't necessarily like technology, the people for whom computers represent "work." Touch-screen tablets occupying the middle will likely resonate better with consumers if they don't think of the device as work, but as a way to enjoy leisure activities like reading books, watching YouTube videos, and wasting time on Facebook. Companies like Dell, HP, and Acer should have a similar goal with their products: don't target the tech-savvy crowd to the exclusion of the mainstream. It's not the best way to build a broad customer base since early adopters are such a small part of the overall picture. Trying to market by emphasizing things like "ours does Flash!" or "this tablet can run multiple apps in the background" will get a great reception from geeks, but not the mainstream Best Buy-shopping public. It's one of the worst habits of gadget makers selling on specifications. "Tech companies tend to focus on features, not benefits," said Rashi Glazer, marketing professor at the University of California, Berkeley Haas School of Business, in a recent interview. "Regardless of segment I'm selling to, I want to focus on the real benefits." And what those benefits will be are still up in the air, of course. Is it an e-reader or an entertainment system or some sort of computer? Is the answer "yes" to all three? That's, as the marketers say, where companies will be able to "differentiate themselves" from the competition. Painful as that marketing gibberish is to the ears, it's what they'll have to do--so long as they also find a way to "differentiate" from the past.